Why advertise your vacancy with us? Register to become a Member And Receive Updates On New Jobs! Emma and Leigh Joy-Staines of Forever Prosperity International Group enjoy taking their spot in the limelight and getting their success in the mumandworking Awards featured in the press. British Franchise Association recognise Dai Alford for winning Most Inspiring Business Parent and overcoming a tough childhood to become a successful franchise business owner. On hearing that she's been nominated for our awards, Adventures of a Potty Mouthed Mummy blogger Sian writes:"When I heard I was nominated for the Mum and Working Awards I didn’t want to hope too much. I didn’t mention it widely. For one I felt like I wasn’t a real plausible winner. I don’t run a booming business. I am not an entrepreneur. But on hearing I made the shortlist, I realised something. My work is hard. I have climbed a steep career ladder and am good at what I do. But my word do I hate being away from my little boy. And I blog about that a lot." We're pleased to see that Mitchy Titch gets featured in their local press as they're shortlisted for one of our awards! "Michele Burton, of Telford, set up Mitchy Titch in 2008 and has since seen it grow to more than 30 licensees and 160 classes across the UK and Ireland. 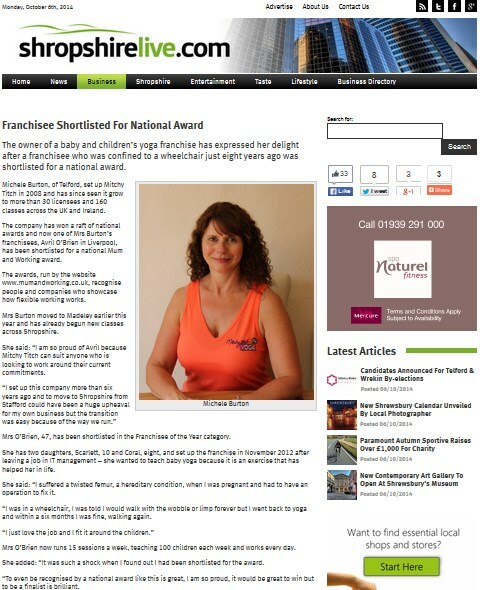 The company has won a raft of national awards and now one of Mrs Burton’s franchisees, Avril O’Brien in Liverpool, has been shortlisted for a national Mum and Working award. 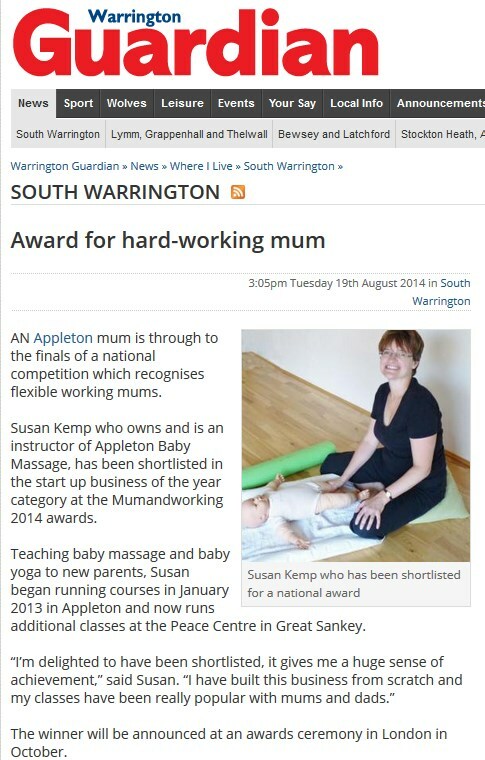 Read the full article at: http://www.shropshirelive.com/2014/10/02/franchisee-shortlisted-for-national-award/"
Susan Kemp who owns and is an instructor of Appleton Baby Massage, has been shortlisted in the start up business of the year category at the Mumandworking 2014 awards and is featured in the Warrington Guardian. Mumandworking are on hand for advice and info at Baby Expo Surrey. With flexible working opportunity providers videos on display and guidance on how best to use the website at the show. Once again the show was fab! Mumandworking sponsor the flexible working zone of Baby Expo Milton Keynes, with exhibitors offering flexible working opportunities for the thousands of visitors that attended. The show was a huge success, see more here.